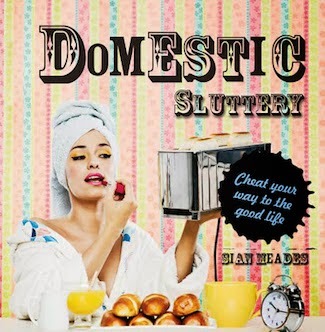 To celebrate Domestic Sluttery turning five, the ladies bought me a gift that combines some my favourite Sluttery things. Nothing says happy birthday like a giraffe on a plate. And now I've got a giraffe on a plate, I've decided that I'd quite like to turn my plate rack into a zoo. 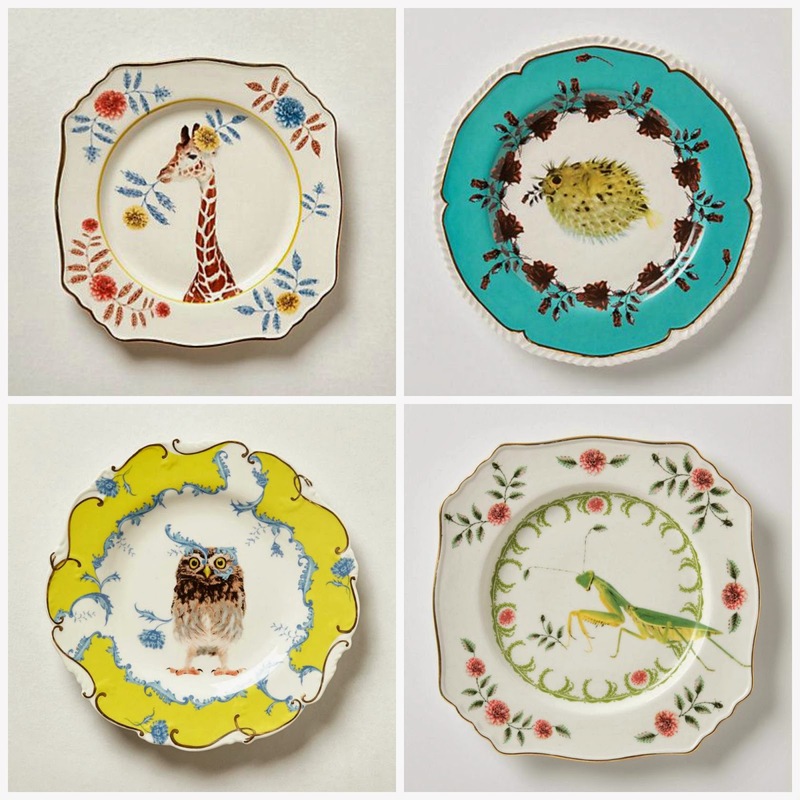 Here's a huge collection of animal plates that Noah would quite frankly be envious of. 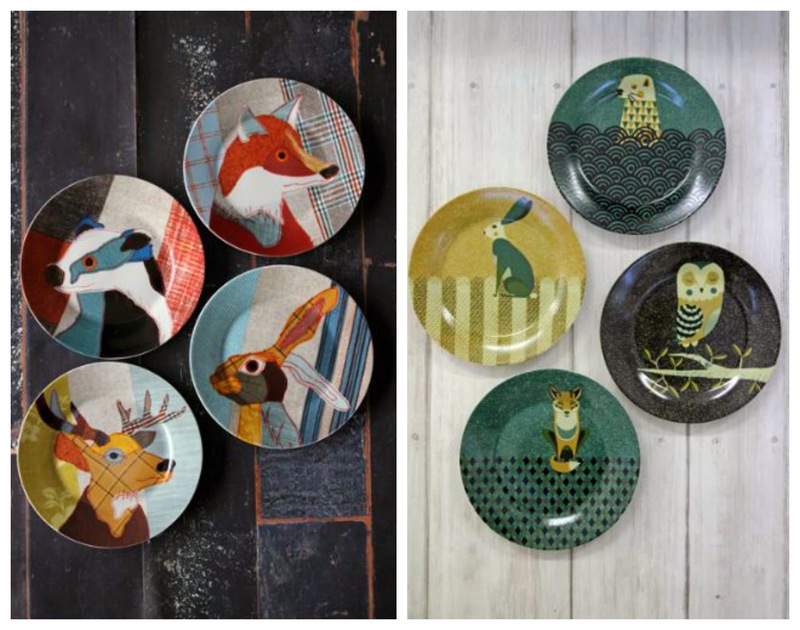 Anthropologie's Nature Table range is a collaboration with Lou Rota (there's my lovely giraffe plate!) I want the entire range. 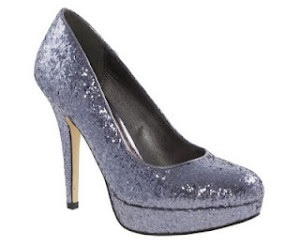 Lou Rota own range is just as lovely. 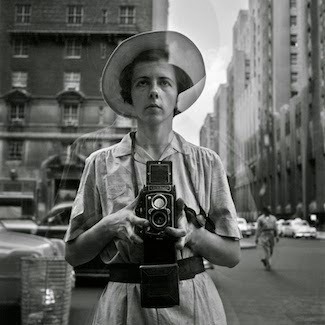 I love the creepiness behind her work. 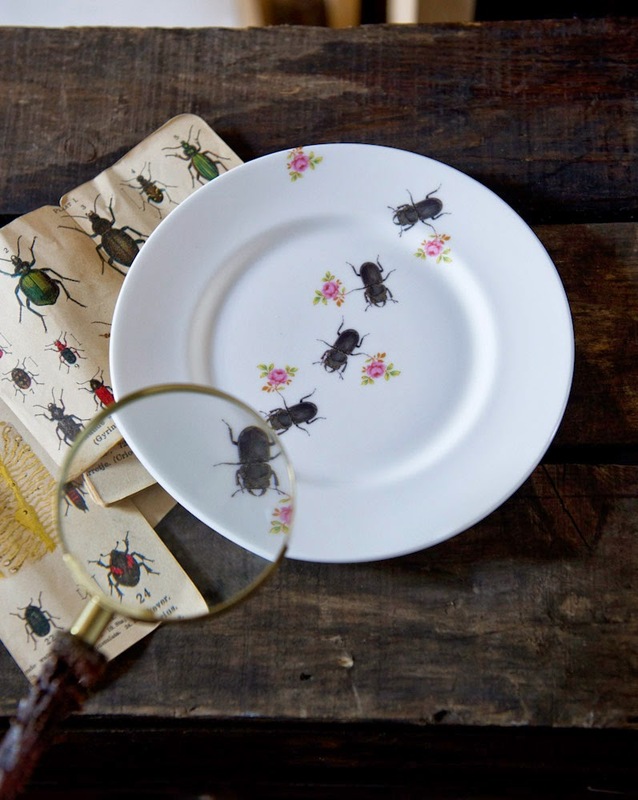 She's relaunching her site so while there's not much available to buy right now, expect bugs galore when her new range launches later this year. 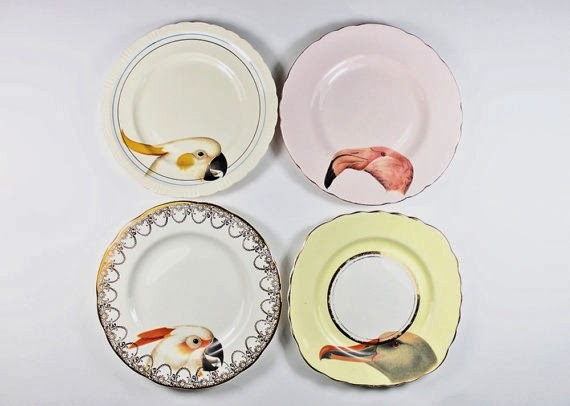 Yvonne Ellen has been a Sluttery favourite for a while not and she doesn't disappoint with her new collection of bird plates. 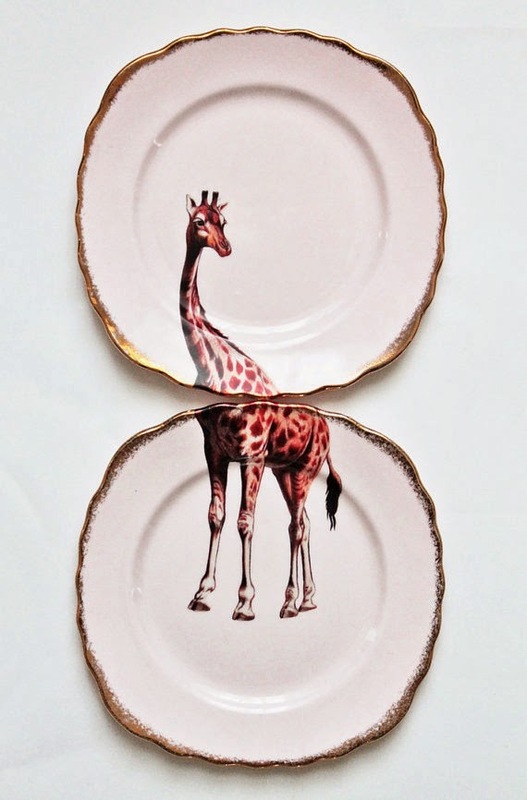 And yes, I obviously still have my eye on her giraffe plates. And her puffer fish plate. 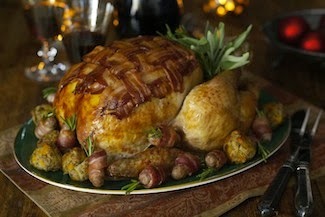 I'm a huge fan of the Melody Rose range (vulture in a hat! a hat!) 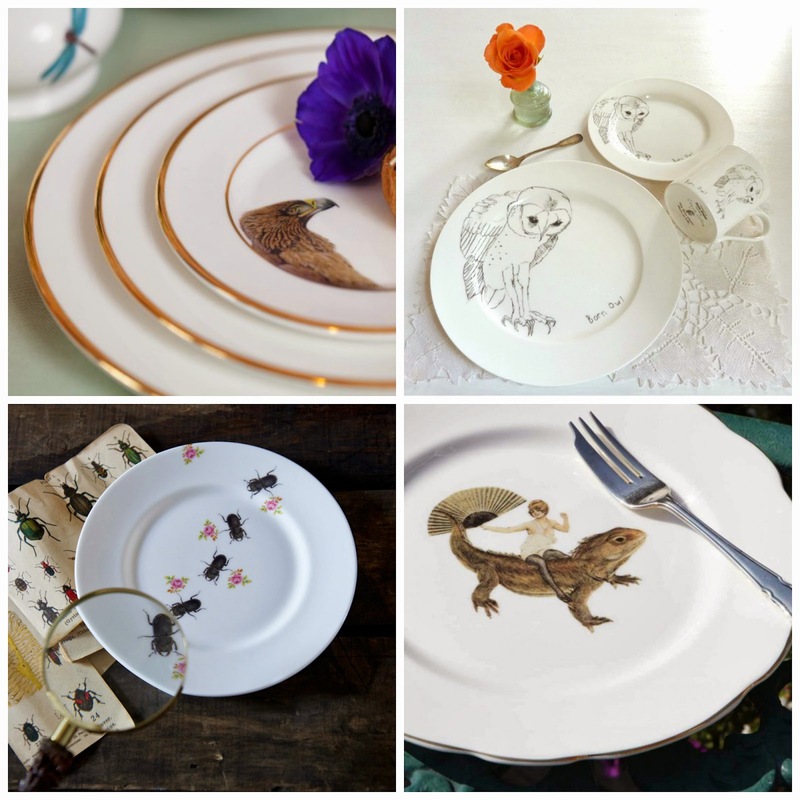 It's just the right amount of animal oddness and a lot of the range is on lovely vintage plates. 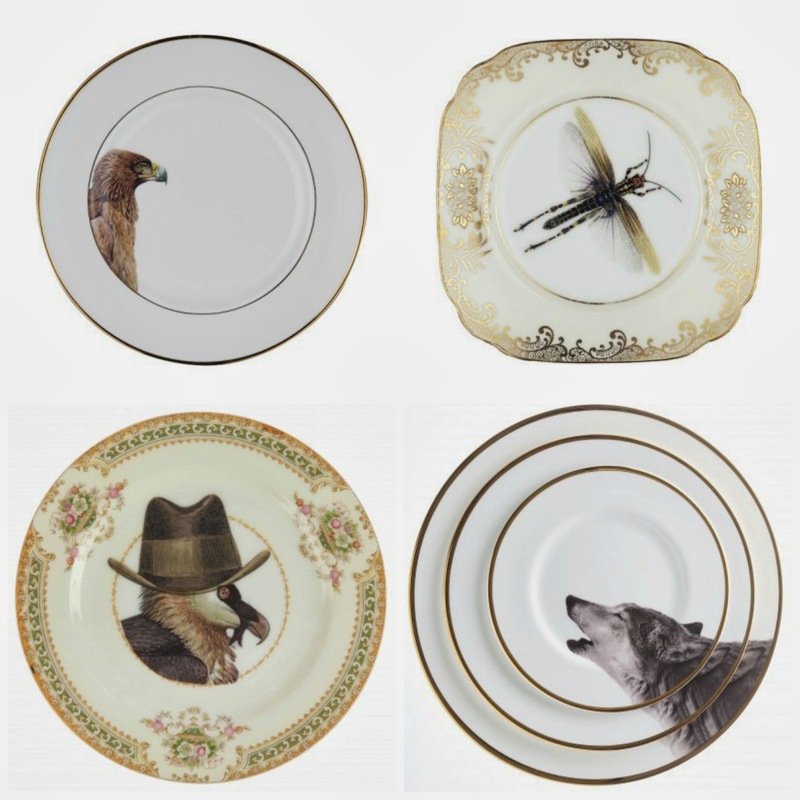 Her gilt-trimmed plates are meant to be treated as dinnerware so they come in a variety of sizes. Prices start at £30. Yeah, that's expensive dinnerware. Don't care, want eagles and vultures. Remember Ali Miller? 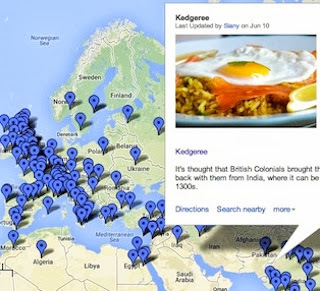 She created the gorgeous map tea set that graced Benedict Cumberbatch's table in Sherlock. But she's not all about maps. Her new range offers a host of quirky animals. 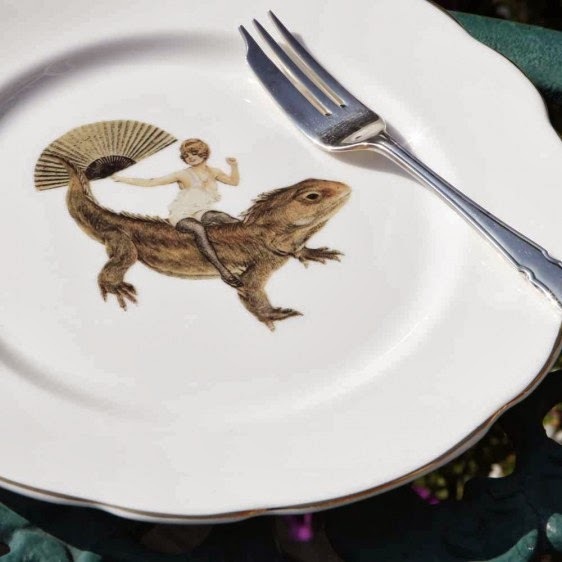 Yeah, I definitely do want a fan-flapping lady in her underwear riding a bearded dragon on my table. I also like her cute tree frog plate. There's a lot of things I'd do for cheese. 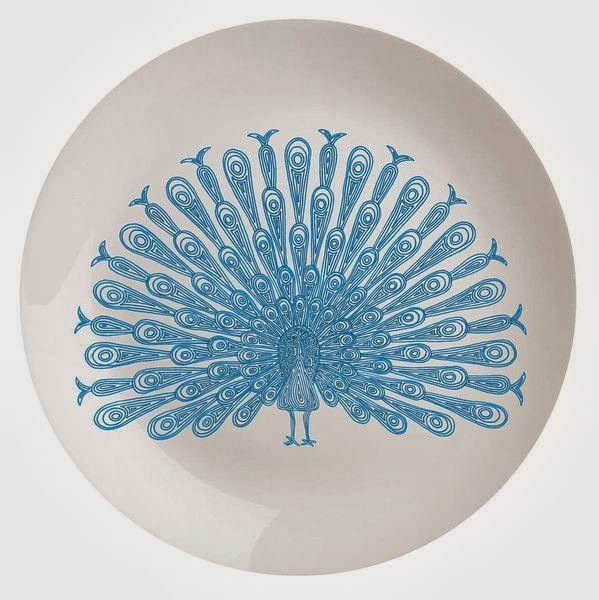 I really like Eleanor Stuart's animal collection, but her peacock plate is definitely my favourite. More birds! 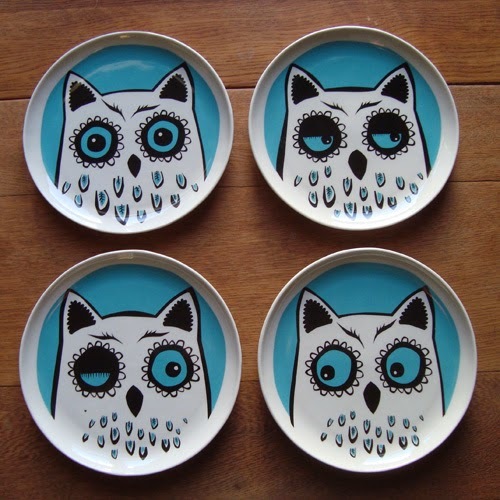 Hannah Turner's sleepy owls come in a set of four. This is handy because I don't want just one and the one with the wink is super cute - she's the one you'll fight over when you have dinner. 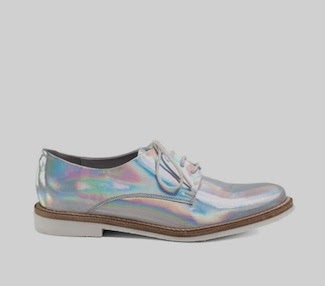 They're £49.99. 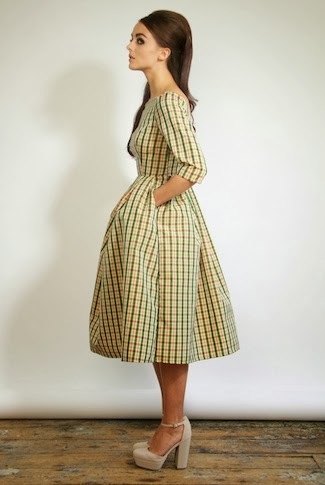 The Elli Popp and Edwyn Collins range is one of my favourite collections. The drawings were part of Edwyn's rehabilitation after he had a stroke and they're so beautiful. 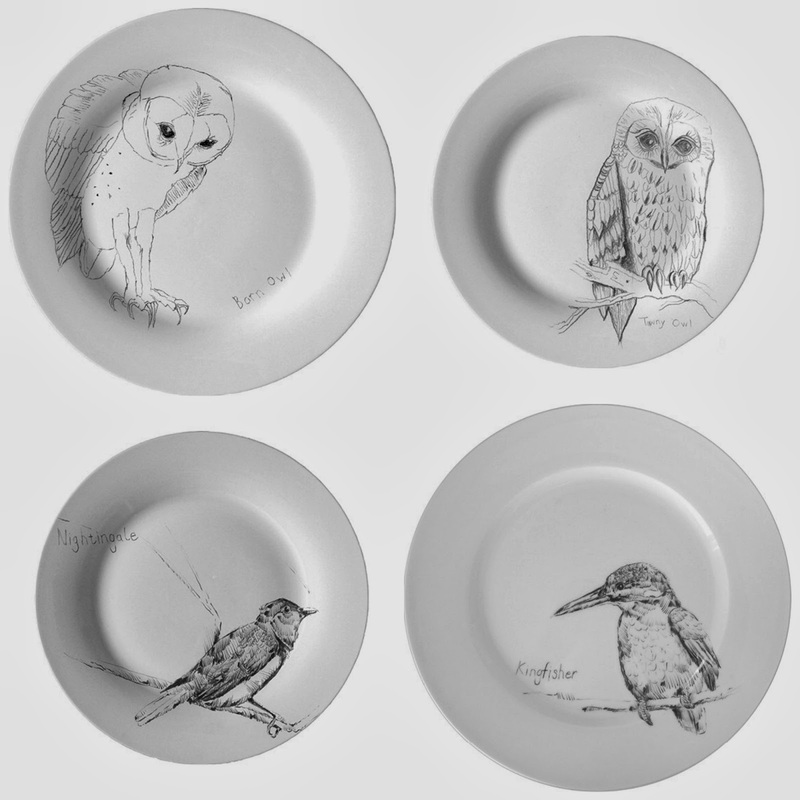 There's heart in these drawings and I'd love them to adorn my dining table. 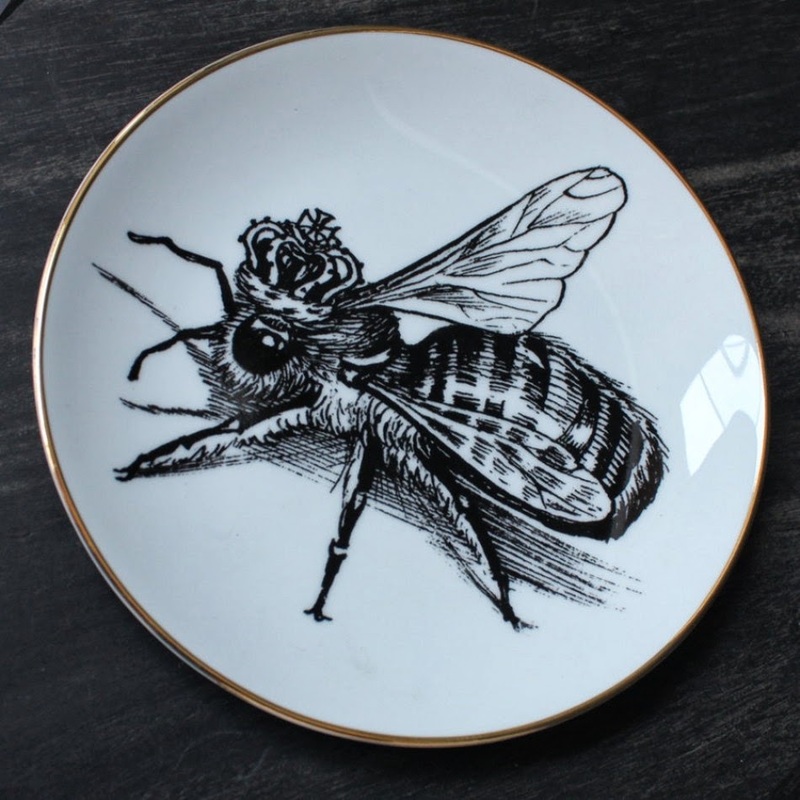 Graham and Green have a lovely range of Rory Dobner plates, but this queen bee plate is definitely my favourite. She's wearing a damn crown for cryin' out loud. 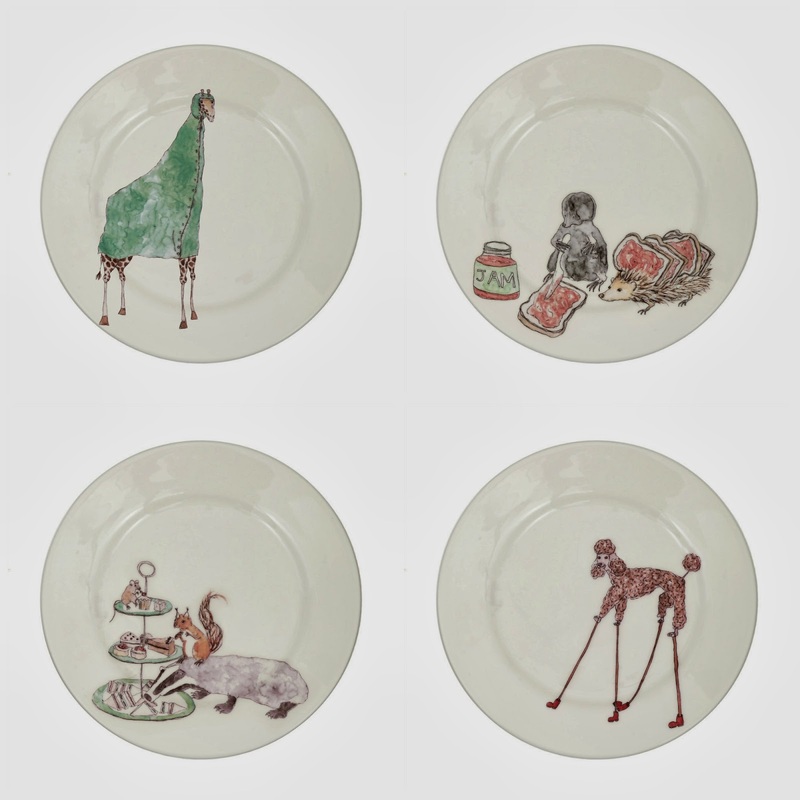 The Mellor Ware menagerie makes my heart sing. Yep, that's a giraffe in a raincoat. And there's a poodle on stilts. And if you look closely, you'll spot a hedgehog doing a perfectly good job as a toast rack. Amazingly, prices start at just £9.25. This is less amazing when you decide you want to buy the entire range and realise you have spent £700 on plates. Finally, let's look at these brilliant woodland sets from Rockett St George. 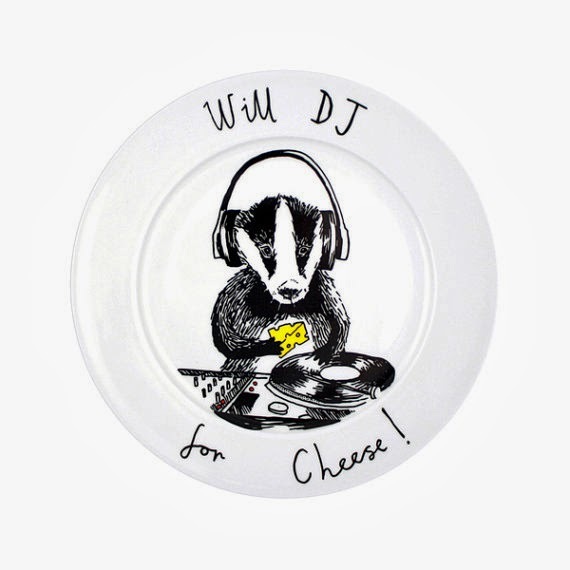 The sets of 4 plates are £20 each and I keep flitting between the sets with the theme to The Animals of Farthing Wood in my head. That foreboding key change is one of the finest things that has ever happened in modern music. Let's put cake on our animal plates and watch the entire series. They're all delicious. The Yvonne Ellen giraffes are next. I'm going with a theme. 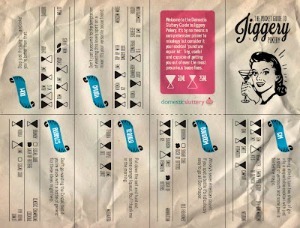 "This is less amazing when you decide you want to buy the entire range have spend £700 on plates" - this is confusing. Oops, we clearly were distracted from our editing by all the animal brilliance. It's now corrected. Yes indeed. My eyes have £££ signs in them, like in the cartoons. Seriously though, that shot with the concrete being poured over the wood terrified me when I was small. But watching it back it's just... odd. How big is this cement mixer supposed to be? Do they really have time to stand and pose when a wave of concrete is coming towards them? 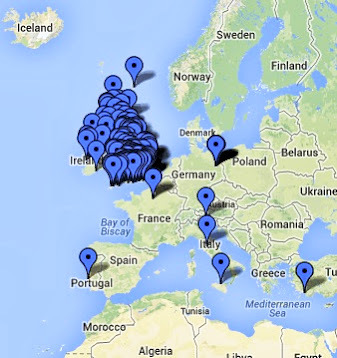 And why does Fox get there really early and then look mega-narked at all the others? Kids' telly these days is TOTALLY rubbish in comparison. I loved this show so much (and yes, will still watch episodes on YouTube). Don't ask questions. Because then I'll have to question my slight crush on Fox and I really don't want to do that.